Once you received your orchid, the only thing you will have to worry about right now, is watering it. PBO orchids are grown in moss, they will require water every 10-14 days depending on the conditions of their environment. Not too hot, cold or drafty. While at the greenhouse, the orchid received all the nutrients it needed to come home to you to live well and be happy. A few blooms withering, you are over watering your orchid. The good thing is that there are more healthy buds on there that will develop into beautiful blooms! Water emergency! Your orchid is dry and not looking good. If at all possible, take the orchid out of the ceramic and run it under lukewarm water. Let it drain and return it to the pot. 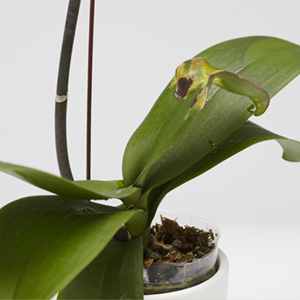 If your orchid leaf looks like this, it could mean it’s diseased. Fortunately, if it is contained to just this one area , you can cut off the leaf. 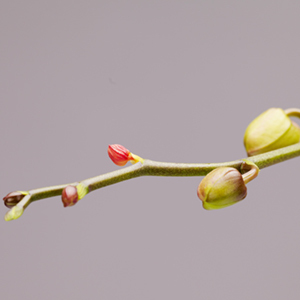 Bud drop is a typical sign of the orchids being transported from place to place with different temperatures. 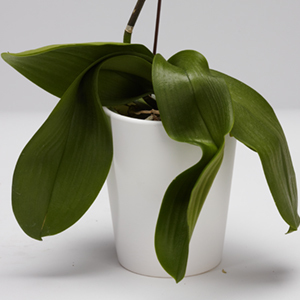 As much as we try for it not to happen, orchid plants stress too. The other blooms should look healthy and no longer give you trouble. Consistent temperature and watering will help to keep your orchid happy. The biggest tip of all is to enjoy the beauty of the plant! I just purchased mini orchid from Health Foods. It was infected and I returned it and they replaced it for a double spike with 6 blooms in all. My problem is after enjoying the new plant it started to drop blooms and now a spike turned yellow so I cut it down leaving me only one bloom and a small leave turning yellow. What is wrong? Claire, Sorry to hear about your troubles and glad to hear the store replaced it. When the store replaced the orchid, did you happen to check if it was over watered or sitting in water? What you are explaining sounds like over watering. Blooms dropping, yellowing spike prime example of too much water. If the small leaf is under all the big green leaves, not to worry as long as the bigger leaves are big and healthy. We would suggest testing the moss to see if the orchid has too much water or sitting in water, if so, let the orchid dry out for a bit. If it is in a ceramic pot and the ceramic pot has water under the plastic pot, empty the water out. 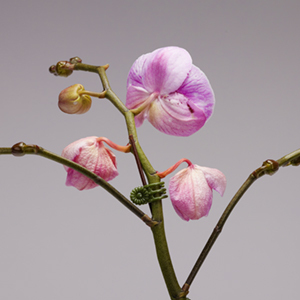 If there are no longer buds and just a bloom on your orchid wait for the bloom to drop and cut down the spike. Care for the orchid as you would if it had flowers on it and you should get a couple of new spikes to grow in a few short months! How do I know when to transplant my orchids to a larger pot? You’ll know when the new growth of orchid roots start coming above the pot. One or two roots are ok. When the bottom of the orchid plant starts looking like a stalk, it’s time to replant! I just received baby phals in water beads for my birthday two weeks ago. I did some outside research and saw people repotting orchids and putting them in moss and tree bark mediums. Am I supposed to repot the phals now? Should I be taking them out of the small clear plastic pot it came in? If so, what do I do with the water beads? I’m just concerned the roots are not getting enough oxygen. Will the water beads result in root rot? Yes really required to take care an orchids when it newly born on earth its required an Orchid Pots for orchids growing,let a visit on this variety of Pots..